How do you successfully publicize a cookbook whose author is unavailable in person? 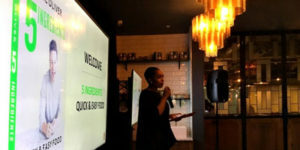 This was the challenge Penguin Random House South Africa faced this September in launching the internationally beloved Jamie Oliver’s new work, 5 Ingredients: Quick & Easy Food. Their solution: have Jamie appear virtually, while prominent members of his international culinary team came together onsite. 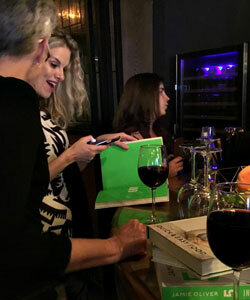 To launch the book with a big splash, the publisher took over Jamie Oliver’s celebrated Italian restaurant Melrose Arch in the Marble Arch section of Johannesburg. Media from Cape Town joined their Johannesburg counterparts there. Sponsors were secured to help underwrite the event financially, and their involvement ensured that the hosts could turn this event into a top-class evening that guests would talk about for months to come. Oliver “attended” via a specially filmed video clip welcoming the guests. On hand to introduce each of the several canapés prepared for the guests was Jamie Oliver’s International Group’s head chef, Shane Smit, who spoke passionately about his own experiences preparing the new recipes from the book and his delight in being part of this food global phenomenon. Chef Shane is himself a renowned celebrity chef who has worked in several international five-star establishments, including Jamie’s Italian restaurant in Oxford, UK. Press and social media coverage of the evening was extensive, and, thanks in part to this memorably creative evening, 5 Ingredients: Quick & Easy Food has become one of South Africa’s top-selling nonfiction titles this fall. 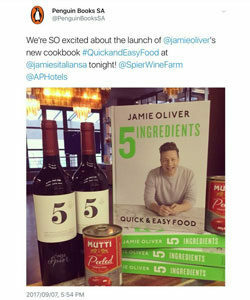 As an additional ongoing promotional benefit from the event, for a limited time, Jamie’s Italian restaurant customers in Johannesburg will be able to try 5 Ingredients: Quick & Easy Food dishes straight from Jamie’s new cookbook, which is an excellent opportunity to generate additional awareness for the new book.